The main attraction of this arid park is of course the waterfall for which it is named. The main falls thunder 56m into a narrow, rocky chasm and are easily accessed by wooden walkways leading from the main rest camp. Look out for vervet monkeys and scurrying dassies – small furry animals that look like rodents but are in fact distantly related to the elephant. For many, this is where Augrabies' wildlife ends, but in fact there is a separate section of the park where antelopes, zebras, giraffes and jackals roam. Outside of school holidays, you're likely to have every viewing to yourself, and I have the fondest memories of an early morning breakfast in my rental car with only a lone male giraffe for company. I switched off the engine and could hear his gentle munching as he breakfasted on camelthorn trees just metres from where I chomped on cereal bars and fruit. Found in South Africa’s Northern Cape on the fringes of the Kalahari Desert, Augrabies Falls National Park is a starkly beautiful and desolate wilderness which centres around the impressive cataract that gives it its name. From the park’s main reception area, it’s an easy walk down to the various platforms that offer different perspectives of this impressive natural wonder, best seen during the wetter months, roughly between December and February. The inhospitable landscape away from the falls means that wildlife is fairly scarce here, but you’ve got a good chance of spotting Oryx, giraffe and other plains game, as well as predators such as bat-eared fox, jackal, and if you’re really lucky, African wild cat. When I visited this park, a large part of the appeal was the ease with which I could get away from the crowds, but you’ll need a 4x4 as some of the roads are rough. I found myself stopping regularly to just take in the silence and the vast, open vistas. Being able to go on bush walks without a guide is always a real treat for me too, but be sure to take lots of water! The centrepiece of this park in South Africa's wild Northern Cape is the world's sixth-highest waterfall, which plunges 56m between towering cliffs. Looking down on the thundering spectacle from the viewing platforms, which are periodically destroyed by floods, gives an awe-inspiring glimpse of nature's might. The waterfall is fed by the Orange River, which flows through this harsh environment like a lifeline, feeding the vineyards and fruit farms of the Green Kalahari. A great way to see the park is on a half-day trip over the river rapids by boat, kayak or raft, finishing 300m above the main falls. Other activities include walking and driving trails, guided night safaris, and a canoeing, mountain biking and hiking circuit; all make the most of a park where most people just visit the waterfall. Animals such as klipspringers, giraffes and Hartmann’s mountain zebras roam the rocky landscape, feeding on camel thorn trees and the giant aloes known as kokerbooms (quiver trees). The name Augrabies actually comes from a corruption of the Khoi-San word meaning ‘Place of Great Noise’: an apt description for the deafening roar produced by the water as it thunders down the 56m high Augrabies Waterfall, especially when the Orange River is in full flood. Wildlife is sparsely distributed in this arid realm with klipspringer, springbok, gemsbok and giraffe being the most commonly viewed species. Although there are a couple of black rhinos resident here, most safari-goers coming to Augrabies with a desire to see Africa’s big charismatic wildlife would end up leaving disappointed. For me, the overnight Klipspringer Hiking Trail is the park’s premier attraction; this self-guided multi-day walk allows visitors to escape the car and really appreciate the park’s picturesque geological attractions like Moon Rock, Ararat and Echo Corner, not to mention the 18km Orange River Gorge carving its way through the centre of this arid park. This would rank high on my list of South Africa’s most underrated gems, despite its rather remote location and limited game viewing opportunities, and a visit is strongly recommended as an addendum to any safari to the Northern Cape’s game-viewing showpiece, Kgalagadi. 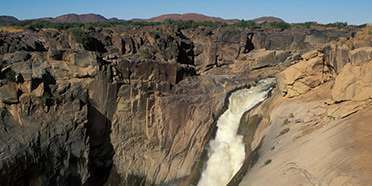 The park is named after Augrabies Falls – derived from the traditional name Aukoerebis, meaning Place of Great Noise – where the Orange, South Africa’s largest river, thunders spectacularly over a 50-metre high cliff into a deep narrow gorge containing several secondary falls and cataracts. Away from the waterfall, the park protects a stunning lunar landscape of rounded granitic protrusions where you can walk freely and are likely to see plenty of antelope as well as several birds endemic to the arid Karoo biome. The night drives are highly recommended, offering an opportunity to see localised nocturnal creatures such as brown hyena, as are rafting excursions on the river above the falls. The park’s most memorable animal residents are the garish Cape fold lizards that sun on the rocks above the main falls. The clue to this park is in its name as the main focus here is the magnificent 56 metre waterfall and the gorge carved out by the Orange River. In full flood it’s a tremendous, thundering experience and in the dry season you can peer right down into the abyss to the river below. Beautiful rocky landscapes but this doesn’t appear on many peoples’ game viewing itineraries. Yes there are springbok, gemsbok, giraffe and mountain zebra here with predators including jackal, caracal, Bat Eared fox, African wild cat but the latter are largely nocturnal . My favourite memory here was sundowners on the rocks by the waterfall watching literally clouds of feeding swifts and swallows in and above the gorge. But a few minutes later we looked up we saw they were bats not birds! How could we have got it so wrong? Next evening we watched more carefully and saw the imperceptible change from bird to bat as one completely different animal took over from the other in the space of no more than five minutes. The focus of in this park is, unsurprisingly, the great cataract of Augrabies Falls, where the Orange River – South Africa’s largest – plunges 56m down a gorge on its journey west towards the Atlantic. In full spate during January/February this is a spectacular sight. Otherwise the reserve has a specialised appeal, which may not be everybody’s cup of tea. Its desolate landscape, characterised by domed rock outcrops and statuesque quiver trees, is reminiscent of much of Namibia. Wildlife introduced into the broader reserve includes black rhino, giraffe and oryx, but I found as much interest in the smaller stuff – from flat lizards and rock hyrax to lovebirds and black eagle – and enjoyed the rock-hopping agility of the abundant klipspringers. Caracals are often seen on night drives and the river downstream of the falls is reputedly a good spot for cape clawless otter – though the only predator I encountered was black-backed jackal. Otherwise enjoy the unique scenery, the desert flora and the clear night skies. There are few places that really deserve the word awesome (in its original, not its California sense). To me, Augrabies is one of them. I’ve only been here once but its weird other worldly beauty has haunted me ever since and I am longing to go back. The Orange River thunders through the desert sculpting a twisted, alien landscape from water-tortured rocks, its masterpiece, the 56m Augrabies Falls and 18km gorge downstream. The Khoi people called it ‘Aukoerebis’, the place of Great Noise, as a cascade of flood water several times the volume of Niagara bounces down a rocky stairway, echoing off the canyon walls, scattering rainbows. On either side stretches a seeming desolation but nothing is what it seems. Look hard and the desert is teeming with life. Strangely architectural quiver trees (kokerboom) and camel thorns stand sentinel against a vast sky. In spring, the tiniest hint of rain and the parched earth blazes with millions of bright flowers. 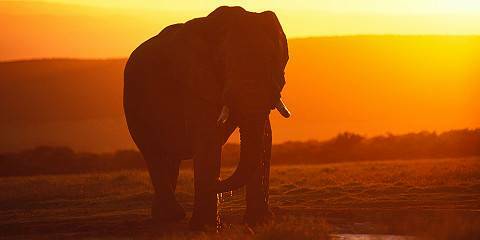 It is for this extraordinary landscape that most visit the 554 sq km (214 sq mile) park but there are also many animals such as springbok, klipspringer, the glorious stripy gemsbok, kudu, eland and giraffe. Rare species include the caracal and Hartmann’s Mountain Zebra. In all, there are around 46 species of mammal in the park, along with 186 species of bird including black storks and Verreaux’s eagles. Augrabies is incredibly remote – about 800 kms (500 miles) north of Cape Town, near Upington in the Northern Cape. It also gets sweltering hot in summer so choose your time carefully if coming here. Whether you choose to hang out along the river or do the gruelling 40km (25 mile) Klipspringer Hiking Trail, you’ll need all the energy you can muster. The primary reason for visiting this park is to admire the impressive waterfall. The Orange River passes over a series of cataracts before dropping 56 metres into a narrow gorge of steep, smooth rock; the water churning below. On our visit, which followed heavy rains, we also saw a number of smaller waterfalls along the sides of the main falls; a sight which I understand is quite rare. The surrounding landscape of moulded granite formations appeared barren, but it was rich in wild plants, and I enjoyed watching a number of comical ground squirrels foraging between the rocks. Other wildlife in the park includes klipspringer, eland, kudu, gemsbok and springbok, but these all tend to be fairly elusive. You only need an hour or so to see the falls themselves, so a visit can be worked into a longer itinerary – in our case en route to the Kgalagadi Transfrontier Park. 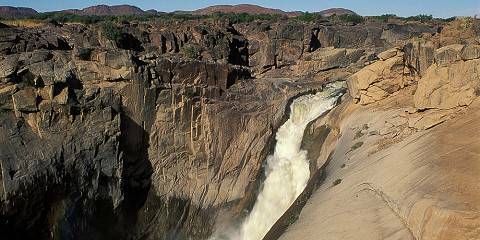 Augrabies Falls is a sight to behold. A platform allows you to almost stand on top of this thundering waterfall crashing down between the bare rocks of the arid surroundings. The park isn’t very big, but definitely worth a couple of drives. I was particularly charmed by the many klipspringers standing in pairs on the boulders and cliffs that make up a lot of the landscape. Another highlight are the very localized Augrabies flat lizards that are common on the rocks around the falls. Other animals you might see include giraffe, springbok and gemsbok. I didn’t see any predators although leopard, jackal, caracal and bat-eared fox are present. I did the ‘Orange Rush’ rafting on the Orange River, which I can highly recommend. If you’ve never seen a rock dassie sprawled out on a boulder in full sunshine squinting lazily as you approach, then make your way here immediately. It’s sooooooooo cute! In a deep rocky ravine, with stunning scenery, this park is named after the world’s sixth longest waterfall and is an impressive sight after a wetting in rainy season. The 10km Dassie Trail, involves scrambling over rocks and oohhhing and aaahhhing every time one of the little furballs is in sight. Apparently they are related to elephants although I have no idea how this is possible as it’s like saying a hippo is related to a dung beetle. You’ll most likely spot some antelope too, especially the klipspringer which loves bounding around this rocky landscape.